Just because you wear foundation, doesn’t mean you have to wear it like a mask. 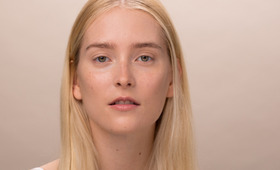 Here are three of the best ways to apply liquid foundation—targeted at your skin’s needs. Need a BB Cream effect in a pinch or on a dime? For a tinted moisturizer that evens out discoloration without weighing down skin, try this: on the back of your hand, mix a pea-sized amount of creamy foundation with a dollop (about half the size) of your favorite face cream. This is a perfect option for those who are less prone to blemishes, have dry skin, or simply don’t require much coverage. Mixing yourself allows you to control the coverage which means you can go lighter on your cheeks and heavier on problem spots. Give it a try. For many of us, only certain spots may benefit from foundation camouflage. For instance, you don’t need to cover up all over your face just because you have enlarged pores across your nose or are prone to acne on your cheeks. With a properly matched foundation, you can pat on a heavy coverage in problem areas and then apply it in lighter stokes elsewhere. You’ll hide what you want without covering up the beautiful areas of skin. Dust all over with powder to blend makeup-heavy areas with bare spots. 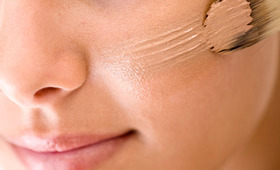 Tip: foundation that clots in the bottle cap makes a pretty convincing concealer. There are times when wearing a full face of foundation is essential, but that’s mostly reserved for performances and photo shoots. A severe case of acne or redness can have us layering on the product in order to face the day, but up close, heavy foundation can look mask-like—especially in the day light. So, experiment with a full face of foundation if you’ll be appearing on a stage, if you’re having important photos taken, or if you’re playing with more extreme makeup looks. Full foundation is essential for surreal looks and drag makeup where the skin becomes a canvas for color and line. Set this look with powder to ensure it stays put.